Today I moved offices. Not far, but far enough for me to look in a cardboard box full of snacks I'd completely forgotten about. 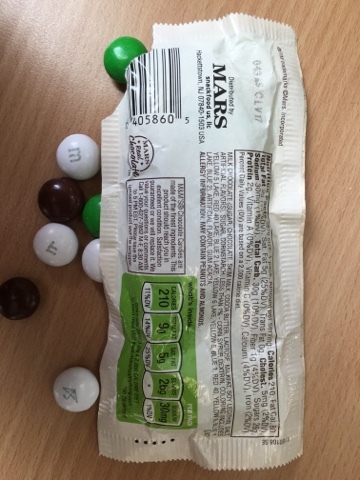 Here is one of the more edible examples - a five year old plus packet of coconut M&Ms a colleague brought back from America that I'd saved for a special occasion. Like the rest of the contents of that box they were either too odd to consider eating or too special to be eaten on a normal day. Then I forgot about them all and they languished for around five years. That said - not only are these sugar coated they are also American candy chocolate so pretty much indestructible. Turns out they are fairly edible even now. 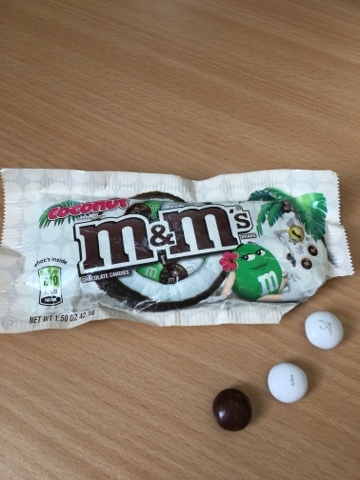 It's pointless actually reviewing them as they just taste like M&Ms that have an artificial coconut taste added - and probably stopped being produced ages ago. I ate about 12 before deciding that there was an old food aftertaste that I shouldn't be experiencing and binned the rest. Lesson? Seize the Snack - don't save them for a special occasion that never arrives!